What Does it Take to Create a Chimpanzee Sanctuary from Scratch? An on-the-ground look at the founding of a new chimpanzee sanctuary. There is no one ‘right’ way to establish a wildlife sanctuary, but each method comes with its fair share of obstacles and it is something that cannot be done alone. After volunteering for the Chimpanzee Conservation Center (CCC) in 2015, I knew that I wanted to continue working, in some capacity, towards the conservation of chimpanzees in West Africa. I thought, who better to contact than Estelle Raballand, a woman who has already helped found two chimpanzee sanctuaries in West Africa, including CCC? When I first contacted Estelle, she told me about her plans to open a chimpanzee sanctuary in Côte d’Ivoire, one of the last remaining nations with a significant endemic chimpanzee population lacking a sanctuary. I was surprised to learn that in the past 20 years, Côte d’Ivoire’s chimpanzee population has declined by a whopping 90%. Because she had already spent several decades living in the Guinean bush at the sanctuary she founded, she was unable to commit to several more decades in West Africa after just settling down in France after a long hiatus. Having been involved in various animal welfare projects within Côte d’Ivoire for several years, Estelle was familiar with the complex situation on-the-ground. Without a chimpanzee sanctuary in the country, any chimpanzees confiscated from the illegal pet trade were sent to the Abidjan Zoo, which was acting as a de facto sanctuary. Unfortunately, they do not have the adequate resources to properly care for rescued animals. In mid-2017, Estelle and Sarah Crawford, an American NGO worker, decided to assemble a team to begin the process of establishing a sanctuary. They reached out to several individuals, all of whom were expatriates who would be in Abidjan for at least another year. I was very fortunate that I contacted her around this time to hear about the endeavor and volunteered to relocate to Côte d’Ivoire to help out! 1. Establish a Local NGO: By the time I arrived in October 2017, the team on the ground had already registered a local NGO called Akatia, which means chimpanzee in Baoulé, a local Ivoirian language, to serve as a legal entity for the project and allow the opening of a bank account. 2. Select a Site: To choose an area of land that is well-suited to establish a sanctuary for chimpanzee rehabilitation, you need someone who knows chimpanzees very well. 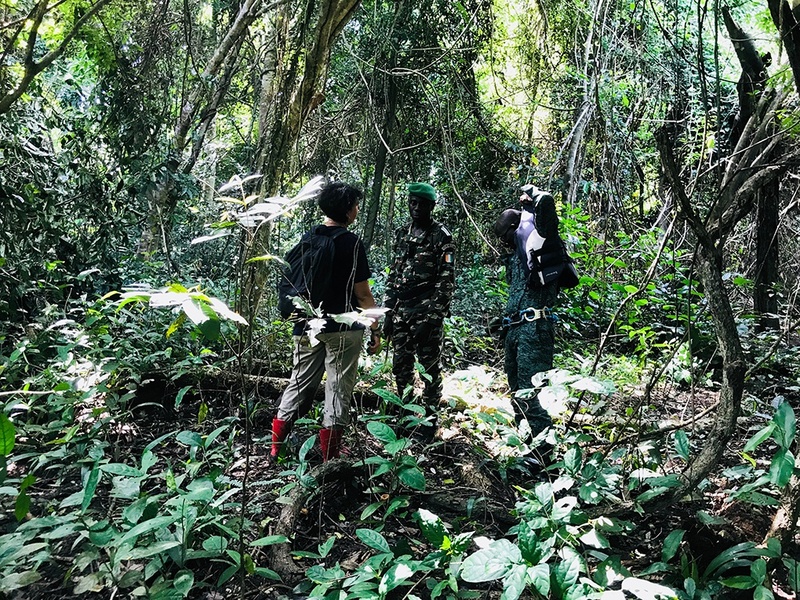 Estelle was there to survey various areas in February 2017, and a 20 km2 area in the Azagny National Park on the southern coast of Côte d’Ivoire was selected. 3. Liaise with Relevant Organizations and Government Entities: This is a continuous endeavor that is key to moving forward with legal agreements necessary to create a sanctuary as an NGO working in a foreign country. A memorandum of understanding must be completed with all relevant entities and ministries. 4. Launch a Publicity Campaign and Begin Fundraising: As with any project, Akatia’s success depends on the funds raised, and this availability is what ultimately decides the timeline of the sanctuary’s opening. Once all agreements are squared away, construction is planned and the sanctuary should begin welcoming its first residents at the end of this year if the necessary funds are raised! If you are willing and able to support Akatia’s efforts, please donate here. Estelle Raballand surveys land for a new sanctuary site. 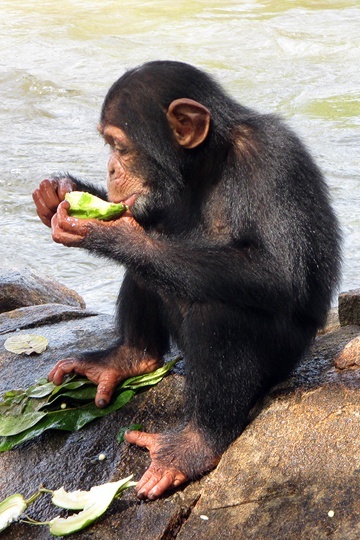 A baby chimp enjoys a snack at Chimpanzee Conservation Center, the first sanctuary that Estelle founded.